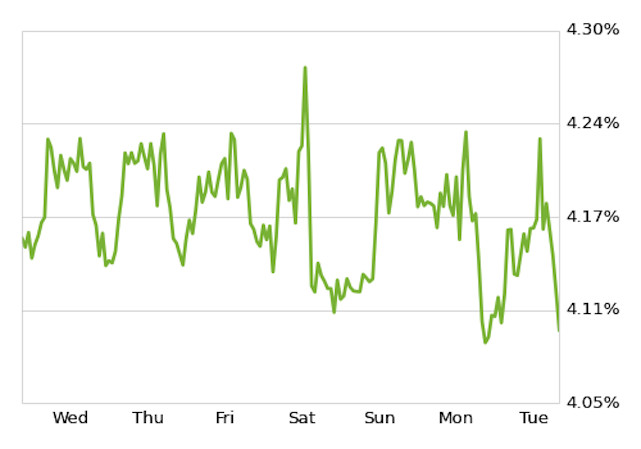 Mortgage rates for 30-year fixed mortgages fell this week, with the current rate borrowers were quoted on Zillow Mortgages at 4.13 percent, down from 4.19 percent at this same time last week. The 30-year fixed mortgage rate hovered around 4.17 percent for most of the week, peaking at 4.28 percent on Saturday before easing down to the current rate. "Mortgage rates were mostly flat last week after the Fed offered reassurance that it would not accelerate the wind-down of the stimulus program," said Erin Lantz, vice president of mortgages at Zillow. "With uncertainty about the Fed's plans dismissed, we expect rates will remain steady throughout the coming week." Additionally, the 15-year fixed mortgage rate this morning was 3.18 percent, and for 5/1 ARMs, the rate was 2.97 percent. Purchase Mortgage Application Activity: Zillow predicts tomorrow's seasonally adjusted Mortgage Bankers Association Weekly Application Index will show purchase loan activity increased by 1 percent from the week prior. To learn more about this Zillow analysis, click here. What are the interest rates right now? Check Zillow Mortgages for mortgage rate trends and up-to-the-minute mortgage rates for your state.